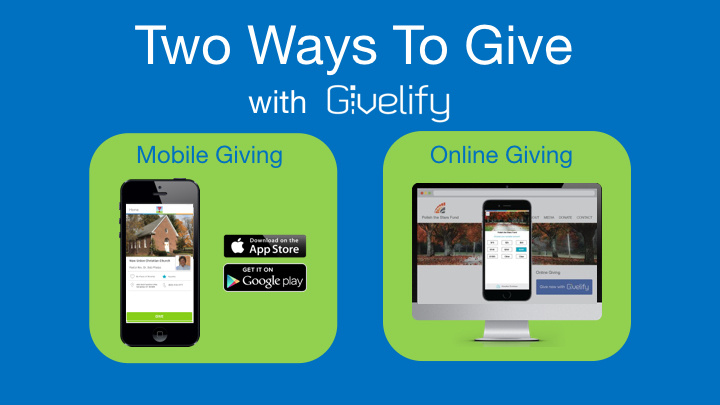 Mobile and Website Giving: We now offer a quick, easy, and safe way to give from a mobile phone or our website through Givelify, which operates on a one-time or recurring gift from a credit or debit card. For mobile phone use, download the app, and search for New Union Church. If you would like to have a regular specified donation processed directly from your checking account, see our treasurer for help in setting this up. Talk to our pastor, treasurer, or a member of our finance team about other forms of gifts, such as remembering New Union Christian Church in your long-term planning. We are ever grateful to all who help with work of the church.